Mobile MAUs represented approximately 80% of total MAUs. year-over-year changes in foreign exchange rates, revenue would have increased 53%. o Data licensing and other revenue totaled $70 million, an increase of 48% year-over-year. o U.S. revenue totaled $463 million, an increase of 47% year-over-year. o International revenue totaled $247 million, an increase of 51% year-over-year. • Q4 GAAP net loss of $90 million and non-GAAP net income of $115 million. • Q4 GAAP diluted EPS of ($0.13) and non-GAAP diluted EPS of $0.16. • Non-GAAP share count to be in the range of 705 to 710 million shares. 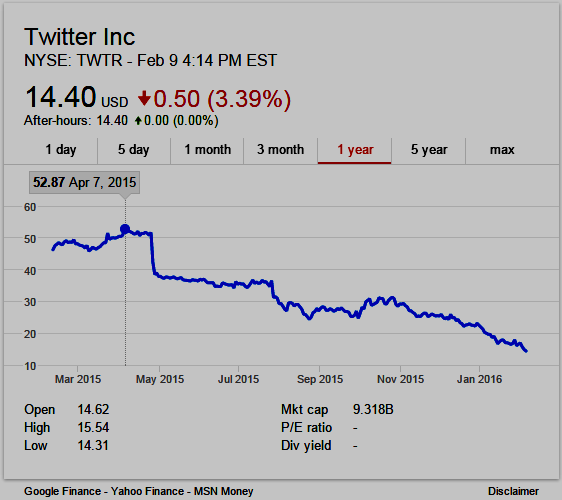 • Capital expenditures to be $300 million to $425 million;"
Twitter Is Undervalued | Seeking Alpha: "Conclusion: Twitter Is A Rare, Undervalued Growth Stock"
The New Yorker declares “the end of Twitter.” That’s a false narrative. --by Will Oremus: "... Twitter is not like Facebook, because it is not really a social network. It is also, fairly obviously, not like Snapchat, WhatsApp, or WeChat, which are primarily messaging services. Nor is it quite like Instagram, which is about sharing photos. Twitter is, at its core, a public forum for information, conversation, and ideas. That is a fundamentally different proposition, one that is essential to specific segments of the populace, including celebrities, activists, corporate brands, and the media ..."
Twitter revenue could go big, but Wall Street won’t care - MarketWatch: "Twitter, with 320 million monthly active users last quarter, suffers by comparisons to Facebook and its 1.59 billion users but attracts more than triple the audience of job-searching professional network LinkedIn, which has 100 million monthly active users."